Yes, I have embarked on another cheesy adventure! 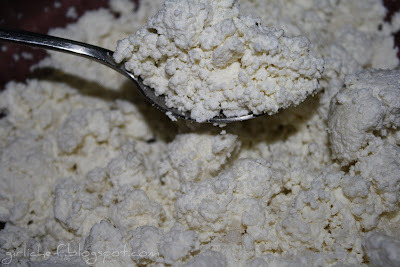 When Natashya suggested we make Cottage Cheese this month, I was a little bit hesitant. I actually don't really like cottage cheese. I know, I know. "Don't like" and "cheese" in the same sentence spoken by me is almost taboo! There's always just been something about it that I had a hard time stomaching. I don't know if it was the texture or the flavor, or what...it just was. But after thinking on it for a few minutes, I knew that we should definitely make Cottage Cheese. I mean...it's good to step out of your comfort zone and try things in a different way, right!? You may recall that I started another blog devoted just to my (and yours...hint hint) cheese making. It's called forging fromage and we're going to pick a different cheese to make every month (or so). Yes, I decided that my love affair with cheese should be aired out for the world to potentially see. I am putting out a call for other closet cheese lovers...or those others already out of the closet. Please join us! You don't have to participate every month...just follow along and hopefully learn something new or work up the courage to make your own cheese at home. And if you have any bit of knowledge to offer or just something cheesy or cheese-related, please let me know...I'd love to fill the pages with guest posts! 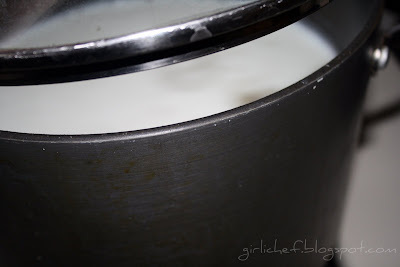 Just recently, the Accidental Farmer dropped by and wrote this post about her experiences making Cottage Cheese. You can use her recipe...or the one I'm about to show you...or any other one you choose! Get cheesy with us. You know want to. Okay, you know I want you to. Back to Cottage Cheese...did you know that Cottaging is actually just a process? A way of making cheese! Cottage cheese is another fresh cheese...usually found in small or large curd. It is said that the term "Cottage" originated started with the simple cheese that was made in...get ready for it...cottages. They used any milk left over after making butter. Go figure. 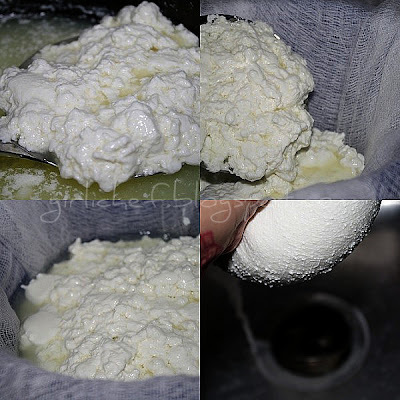 "It is drained, but not pressed so some whey remains and the individual curds remain loose. 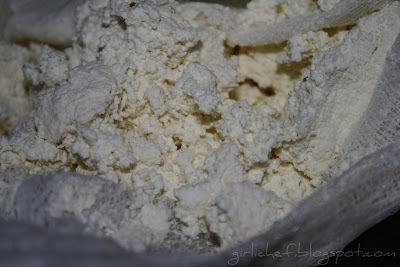 The curd is usually washed to remove acidity giving sweet curd cheese. It is not aged or colored. Different styles of cottage cheese are made from milks with different fat levels and in small curd or large curd preparations. "* To my very pleasant surprise I loved the homemade cottage cheese. Probably because it has basically the same flavor profile as Queso Blanco! As a matter of fact, if you press it, that's what you'll get...a "pot" cheese! Cool, huh. Large Curd Cottage Cheese from The Home Creamery by Kathy Farrell-Kingsley 1 gallon milk...whole, low-fat or nonfat 1/4 tsp. liquid rennet 2 Tbs. water 1/4 c. cultured buttermilk 1-2 tsp. salt I used Sel Gris Sea Salt Pour the milk into a large, heavy-bottomed pot and heat over low heat to 95 degrees F. Dissolve the rennet in the water in a small cup. 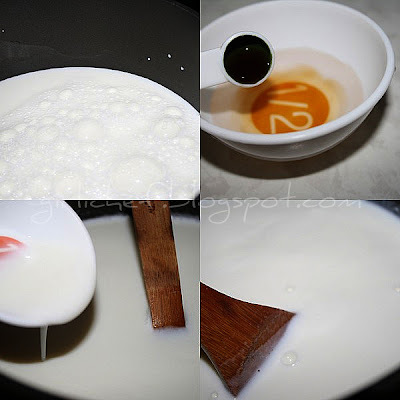 Stir the dissolved rennet into the milk for 30 seconds. Stir in the buttermilk. Remove from heat, cover and let stand 30 minutes to 1 hour... ...or until solid curds form. 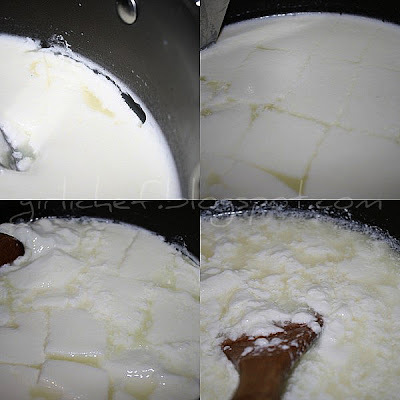 Cut curds into 1-inch pieces. Heat the curds with the whey over low heat to 110 degrees F, stirring gently to bring curds from the bottom to the top (stir for the first 5 minutes, then every 5 minutes). 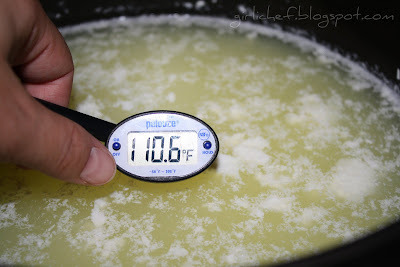 It will take about 30 minutes for the curds to reach 110 ...or so she says. Seriously, it took me less than 10 over the lowest heat! Pour or ladle the curds into a colander lined with a double layer of butter muslin I used a fourple...or is it quadruple...layer of cheesecloth. Let the whey drain ~5 minutes, then gather together the edges of the muslin and rinse the cheese under cold water, squeezing while rinsing. Squeeze the cheese dry, then transfer to a medium bowl and add 1-2 tsp of salt to taste. Cover and refrigerate until ready to use or up to 2 days. Or, if you are one of those people who actually like what you've come to expect of Cottage Cheese...i.e. creaminess... simply stir in a little heavy cream or half & half just before serving. You can eat or use this cottage cheese as you would any store-bought cottage cheese...but the flavor is miles better! I like to eat it directly from a spoon. Have I persuaded you to try making cheese at home yet??? Give it a try...post the results on your blog...succeed or fail...and then head over to forging fromage to join our cheesy escapades! *source: answers.com I also want to give a huge thanks to Emily of Marvelous Recipes for passing Neno's Award on to me!! If you're on the look-out for awesome family friendly dishes...head on over and pay Emily a visit...you won't be disappointed! You're the American version of Nigella Lawson, the kitchen goddess! I made cottage cheese, blue cheese and ricotta years ago. At the time, the effort was undertaken to see if anything resembling and tasting the cheeses could be had. They were OK. Now we are out here in cheese country it simply is not cost effective to make it at home, though I applaud the effort of anyone who chooses to do so. I trade bread for goat cheese so good it will make you weep. I'm a happy camper. How cool. I've never made my own either and don't really like it all that much. Reminds me of the fifties when they thought ladies that lunched would like a plate of cottage cheese with canned pears. Awful stuff. However, when we try to eat low carb we have cottage cheese for breakfast with salsa and cucumbers. I know yours would be so much better than store bought. Okay - I have to admit this looks pretty good. I don't do cottage cheese anymmore - I think when acting - I dieted so much and forced it down - to you know - eat healthy. And I am a cheese fiend. However, this looks like fun! I adore cottage cheese and I do not know why. However, people who put fruit in their cottage cheese are mutants...just sayin'. You are the cheese making queen!!! Looks awesome!! One of these days i will venture into making my own. Wow, there's nothing you can't do, is there? There's just no comparison to store-bought cheese. Yours wins, hands down. I love eating cottage cheese with crackers..Can I have some? ARE YOU KIDDING ME?? Dar, you are UNBELIEVABLE!! I have to go back and read this post again to see if I think I could do this!! I definitely want to try. I might need your help. 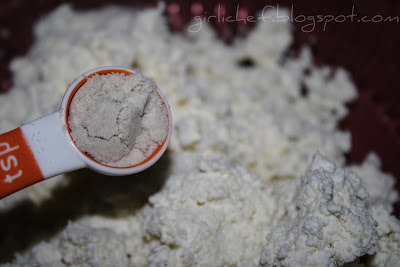 Homemade cottage cheese!! YAY!! thanks for your comment the other day. someday I will make cheese, someday. this is so impressive! i'm craving cottage cheese all the sudden, but i bet it won't be near as good as your homemade kind! I am so so so so impressed! I enjoy learning this process from you. You have a nice way of 'teaching'. Highly impressed with your results. It looks lovely. My fav is cottage cheese mixed with pineapple. 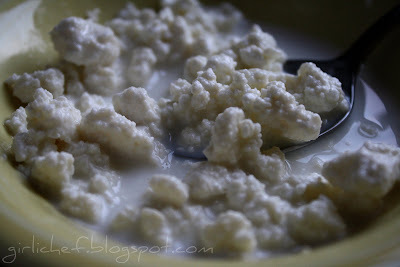 i LOVE homemade cottage cheese..nothing compares to its taste! But, sadly ive never got around to making it at home. It looks great! I am all for the creamy version. Thanks for the history and step-by-step photos of this cheese. :) Hopefully I can make it on the weekend. that sounds amazingly good - and i think that even i might be able to make this type of cheese - sheesh! how good would that be to have in the fridge. is it true that it will only keep up to 2 days in the fridge though? Amazing as always. I'm still tempted by your mozzarella. I used to really like cottage cheese then my Dad told me that it was curdled milk and that completely grossed me out so i stopped eating it (for years!). You'll be happy to know that I still eat it, in fact there's not much cheese I don't eat. This is amazing! You've successfully explained and illustrated a very detailed process! Great job! You are amazing. I am as afraid of cheese making as you are of bread making...haha. Very fun! Your cheese looks great! I like to eat cottage cheese in a half papaya with a little lime or with chopped fresh herbs and lots of black pepper on good crackers. Ohh yum - I've been pondering to make cheese at home for ages (I really need a better cream cheese than what I can find in supermarkets here...). Now I'm inspired again! I wonder if you can find vegan rennet around here. Or do you think this is possible with another curdling agent, i.e. lemon juice? Jokergirl...I emailed you a little something I found...but please join in! Donna...can't you just picture me in my chef/professor uniform...grrrr. Man, cheese making is the one thing that's intimidating to me, dunno why, you make it look so simple! Maybe I'll conquer my fears after the holidays. I bow to you chickie! I am an out of the closet CHEESE lover! I've only made ricotta cheese and mozzarella - this one is on my list! I'll be following and admiring you from my closet. I love eating cheese, almost any kind, but especially fresh types, and I use them a lot in cooking. I love cottage cheese and pineapple! This look so yummy. Excellent job! Your going to be a cheese pro! Although I enjoyed seeing you make it, I'm just not a cottage cheese fan. I know why, but since this is a food blog I won't mention it. Heh. I love cottage cheese... I eat it every day... I love it for breakfast with fruit... when I have time I will so have to try making it myself... never thought about doing it... thanks for the idea! you make it look so easy but i'm still scared! LOL. I like my cottage cheese with canned peach slices. (cuz it gets all that sugary peach juice mixed in there). Like you, I'm not a huge fan of the cottage cheese. I'll cook with it, but don't buy it just to eat. I did really enjoy seeing how you made it in your very own kitchen. I'm always impressed by your cheese makin' skills. I never would have thought of making fresh cheese in a million years, but it sounds wonderful and looks delicious! Homemade cottage cheese sounds wonderful! My grandma used to make it when I was little and I really enjoyed it! You are a groovy girl, no doubt in my mind, a kitchen goddess as someone earlier pointed out. No argument from me as I can find no flaw in that observation, grins. Your cottage cheese looks so very very good. I haven't had homemade cottage cheese since I was a young girl. Wish I had the courage to try this as I do enjoy it. Omgosh no way!! This is amazing! Oh, I love cottage cheese. I thin k it's amazing that you can make this....very cool girlichef! I am not a fan of cottage cheese on its own, but I do have to admit it's nice to have around for lasagne & things like that. Another great job! You guys are rocking it! Look at you you little cheese maker:) This looks really yummy! You are so adventurous. I do like creamy store bought, but I'll bet your stuff is better. interesting-I know that you will think this is disgusting I like my cottage cheese with warm pasta sauce-i know rather strange. Wow! You ladies amaze me with all the cheesemaking. I am so impressed. Pot cheese? I've always wondered what it was - and it looks super yummy fresh! I am so in awe of anyone who can make any kind of cheese at home! I'll just have to pretend that my tub of 2% Land o' Lakes cottage cheese was homemade . . . Going to check out your new 'fromage' page!